He cashed checks in all six FLW Tour events, followed up his worst finish with back-to-back Top-10s, qualified for his fourth Forrest Wood Cup and second Toyota Texas Bass Classic, and trailed only Andy Morgan in the final FLW Tour Angler of the Year (AOY) points. Not bad for the 26-year-old from Benton, Ark. He’s already drawn up his to-do list for 2014 and at the top is to win AOY. Yeah, that’s at the top of everyone’s wish list, but a quick look at Blaylock’s career arc indicates his desire to assume the AOY throne is nothing to sneer at. Two years ago, he was 14th in points. Last year, he slipped to 21st before rebounding in a big way this year. Only a 56th-place finish at Beaver Lake this season prevented him from putting more heat on Morgan at Lake Chickamauga to close the year. “It could’ve been better and when it was over, it really frustrated me,” he said, reflecting on the Beaver result. “Looking back now, I feel worse because that’s the one that cost me Angler of the Year. When the tournament was over, I was pretty upset with that finish. I was off to a good start and being able to fish Beaver close to home where I’ve fished 100 times. To finish 56th, I didn’t like it. It fueled that fire, though, and I kept on chugging. I didn’t expect to come back and finish 2nd in points. I scratched and clawed and got back up there. While Blaylock was happy with the consistency he showed in Tour events, two tournaments at the Red River – the Bassmaster Central Open in April and the Forrest Wood Cup in August – continue to confound him. The Central Open came 2 weeks after Beaver Lake and gave him a perfect opportunity to get that bad taste out of his mouth. He wound up 114th, an outcome that still irks him. “I couldn’t catch ’em,” he said. “That kind of thing frustrates me. I know it was a smaller event and wasn’t that far from home so it didn’t cost me a lot, but that’s not how I like to do it. It didn’t let the wind out of my sails, but I felt like I was on a roll. Then I went in there and dumped a tournament. I had to stand back up and shake it off and carry on. After his stumble at the Central Open, Blaylock was sure he’d learned something he could apply at the Red in August for the Cup. He made a trip down before it went off-limits and came home thinking main-river fish would prevail over those swimming in the backwaters or lily pads. He was sorely mistaken. Next on Blaylock’s fishing to-do list is to win Angler of the Year. When he returned for official practice, his confidence soared after finding a backwater pond that produced 18 pounds for him pretty quick one morning. He also had some fish in the 2- to 2 3/4-pound range on the main river. He even told his brother and practice partner, Keeton Blaylock, who qualified as a co-angler, that he couldn’t recall being that confident before a Cup. “It can’t be this good,” he told him. He was boat No. 1 on day 1, meaning he had his pick of where to start. He opted for the backwater in Pool 5. He scratched together 6-14 on day 1, then changed it up on day 2 and fished in pads. He wound up catching 10-06, his best effort at the Red, and finished 30th. Blaylock fished out of FLW sponsor-wrapped boats the first 4 years of his career, a different one each season. He grew weary of the constant change and when STP didn’t return as an FLW sponsor in 2013, he started to build his own stable of sponsors. He couldn’t be happier. While there is some security in having a team deal through FLW, he says the short-term involvement of some sponsors made him step back and examine what was going to be best for him moving forward. “I’m happy to have had the team deals I’ve had and it stinks when those companies pull out and go away, but that’s how it is,” he said. “Am I happy with where I’m at now? Absolutely, because my family can travel with me and I don’t have to work the Fun Zones and stuff like that. I will stay and hang around for the sponsors I have now if they need me to, but just having that freedom and not being tied down is good. Stetson Blaylock finished 9th at the FLW Tour Grand Lake event on June 9th. His 65 pound, 12 ounce four day total was enough for him to crack the Top 10 for the second consecutive tournament of the FLW Tour season. “I had a solid tournament. Pretty much everything I hooked I got into the boat. That’s what it’s all about. You can’t miss opportunities,” explained Blaylock. If you are the type of angler who puts as much emphasis on rod section like Stetson Blaylock does, then you need to pay close attention to 13 Fishing. You may not have heard of 13 Fishing yet, but watch out because this company is starting to pop up everywhere! Already known for their dominant ice fishing brand, 13 Fishing has introduced a line of trendy yet functional rods to their brand but don’t be mistaken, this isn’t only a rod company. 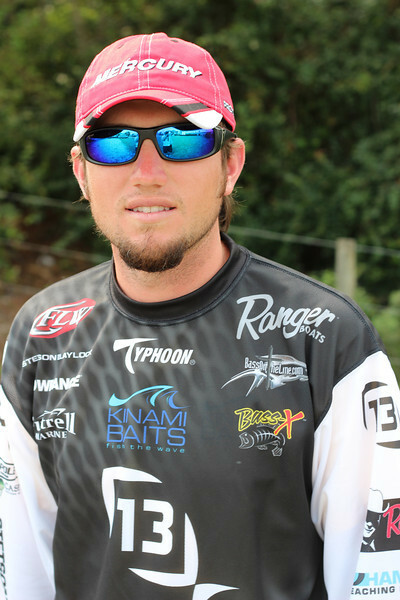 “13 Fishing is a brand not only a rod company”, says FLW Pro Stetson Blaylock. “We have been in the ice fishing industry for a few years now and have done really well and this past summer we launched our freshwater line of rods”. Unlike many other companies, 13 Fishing manufacturers their own rod and rod components and in doing so, this has given them the ability to test their rods to the max, ensuring that every aspect and component of their rods are perfected. Where some rod companies may only test a handful of prototypes before releasing a product, well let’s just say that 13 Fishing got their share of testing in! “We fished and tested 622 different blanks before we got the final product nailed down”, Blaylock says. “Since everything with the exception of the recoil guides on our Envy rod is manufactured by us, we wanted to make sure that everything was perfect. Our team literally sat down and drew all the components like the reel seats, created prototypes and we tweaked them from there”. COLUMBIA, SC — Berkley® XL/XT was awarded with the Best New Line Awards at this year’s ICAST show in Orlando, Fla. Berkley XL and XT have been industry standards, and the line continues to get better with the improvements to these monofilament lines. With the 2012 Forrest Wood Cup slated for Aug. 9-12 on Lake Lanier in Duluth, Ga., the clock continues to tick toward the start of one of the most prestigious and exciting bass-fishing championships in the nation. In an effort to provide bass-fishing fans with a little more perspective and background on the competition, FLWOutdoors.com is launching a five-part series/overview of each of the 46 qualifying pros – one of whom will walk away with the title of Forrest Wood Cup champion. With a guaranteed first-place prize of $500,000 on the line, there is clearly plenty at stake this summer in Georgia. So without further ado, let’s meet the contenders.